Following on from the successful event at the Nene Valley Railway where we named GBRf locomotive 66716 as part of our Centenary celebrations, this event was organised with grateful help and assistance of our friends at London Underground. Special mention must go to David Brabham and Andy Barr for the considerable amount of time and effort that they both contributed. On Monday 12th September, a total of 186 members and guests travelled aboard our Centenary charter train on London Underground's Metropolitan Line. The special train was formed of Metropolitan Railways No.12 "Sarah Siddons", a 4TC set and ex-BR Class 20, 20227. 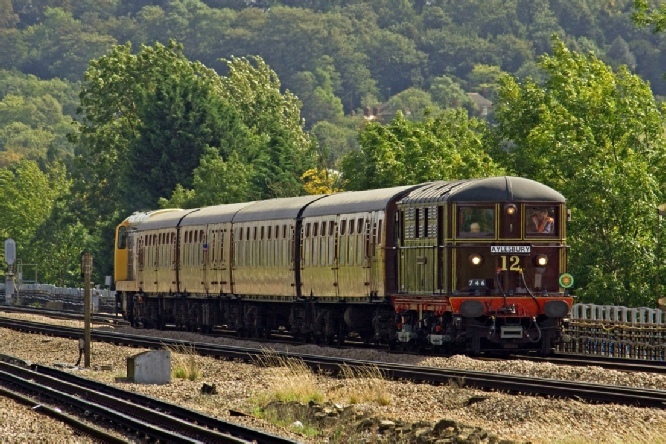 The train made two return trips between Harrow-on-the-Hill and Amersham with members being able to alight and take photographs at each end of the journey during the brief reversals. For those unaware, particular mention must be made regarding the use of the whole train without any charge to the Institution. Your Council were only too aware of what costs could have been incurred, and we thought it only right to make a donation to a worthy cause - hence the on-train collection. 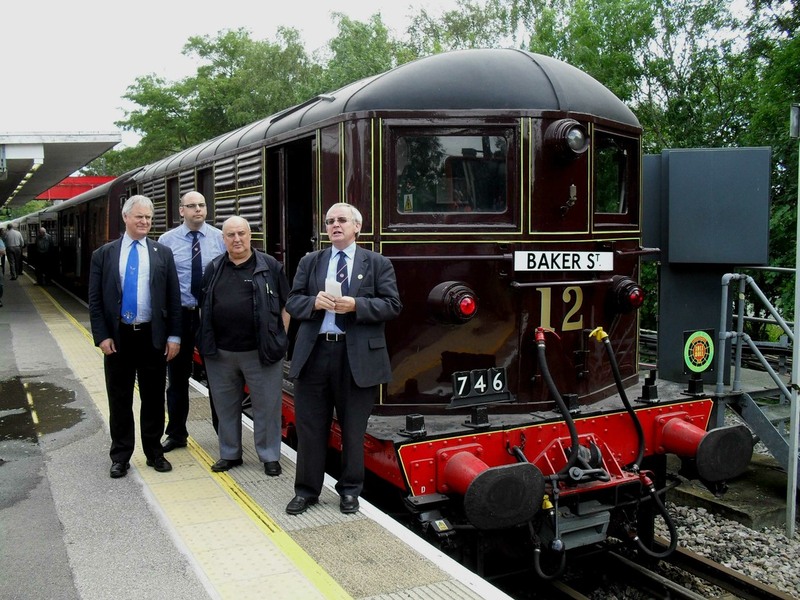 Through the generosity of our passengers on board, we were able to raise 1119.40 for The Railway Mission. 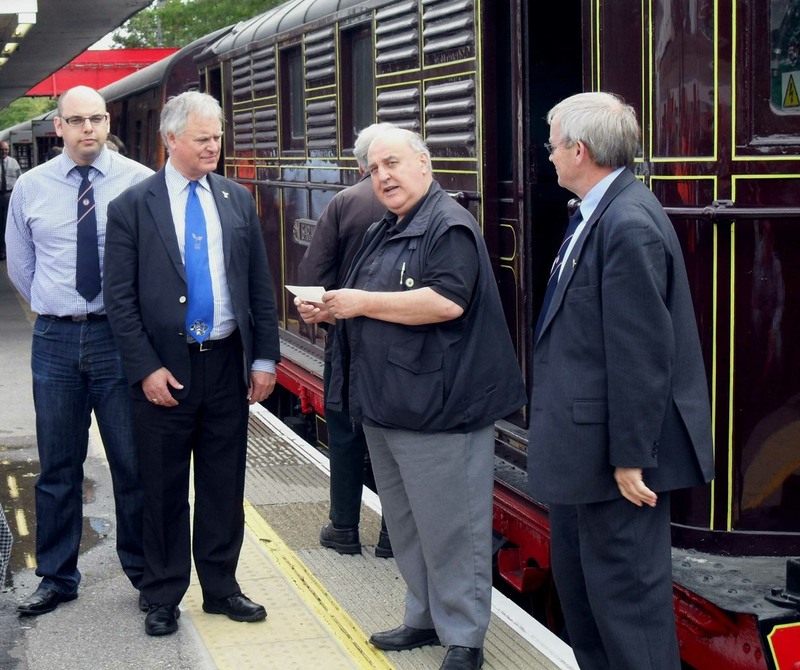 On arrival at Amersham, our President, Nick Agnew, presented a cheque to Humphrey Gillott (Railway Chaplin, and L&CI member) in front of the immaculately turned out Sarah Siddons, which carried the Institutions new headboard during the journey. 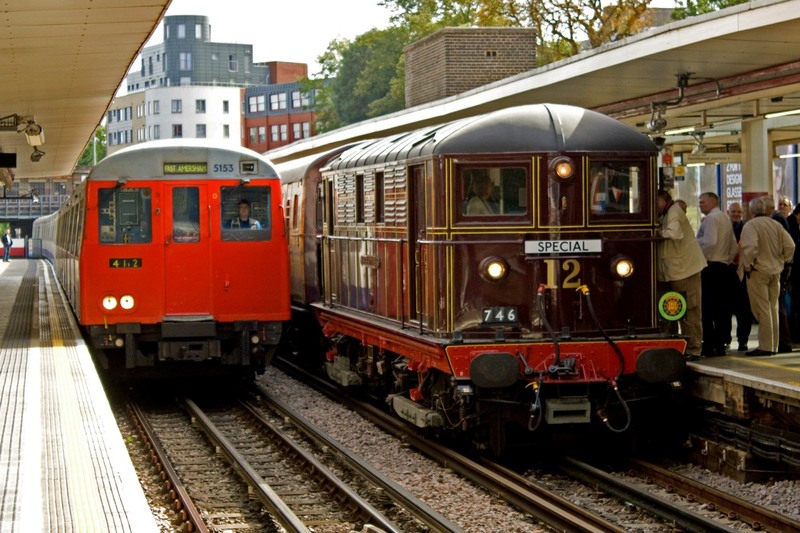 In closing, the Institution would again like to thank all at London Underground for their assistance, (including the drivers & on-train stewards), and also to all of the members & guests that travelled aboard the special train with us. Back in August, thanks to a posts on the Preserved Locomotive Enthusiast Group Website, I became aware that preserved Metropolitan Line electric loco No. 12 'Sarah Siddons' would be undertaking a special railtour on 12th September to celebrate the centenary of the Locomotive & Carriage Institution. A quick Google on the internet gave me a contact email address for the tour and I sent off an email asking whether there was any way I could travel on the train. To my great delight I got an email back saying I would be sent a ticket. While I've seen 'Sarah Siddons' on a number of occasions, most recently at Upminster Depot Open Day in August 2009, this was my first opportunity to travel behind the locomotive. On the 12th August I made my way to Harrow on the Hill, passing 20 227 as it hauled the tour train into Neasden depot at 10.05. Having got a few supplies at Harrow I made my way to the end of platform 1 to await the arrival of our train. Everybody at the end of the platform soon got chatting, mainly about the weather which was much better than forecast. The booked arrival time of 11.15 came and went with no sigh of the train. The knowledgeable amongst the platform enders said we would have to wait for the Chiltern Line train to Aylesbury to clear before our train arrived. This duly happened and Sarah Siddons then appeared round the corner about 5 minutes late. The tour was due to make two return trips between Harrow and Amersham, but as I had a work meeting in the afternoon I could only do one of the trips. I therefore found a compartment near the guard, who said it would be fine to alight when we returned to Harrow. The train seemed to be full, certainly the coach I was in and we soon got chatting about the tour. General speculation was that we wouldn't be allowed off at Amersham, which was a shame as I wanted to take photographs. The run north to Amersham went well taking the fast lines. From where I sat and drawing on electric power Sarah Siddons made little noise taking our train out into Metroland. These days the whole journey is pretty much in suburbia with little else other than back gardens and embankments on view. As we travelled we were all handed information about the locomotive and the actress it takes it's name from. Originally part of a fleet of 20 Built in 1923, Sarah Siddons was one of 20 locomotives built by the Metropolitan Railway for hauling trains to Harrow-On-The-Hill and then Rickmansworth (following electrification). 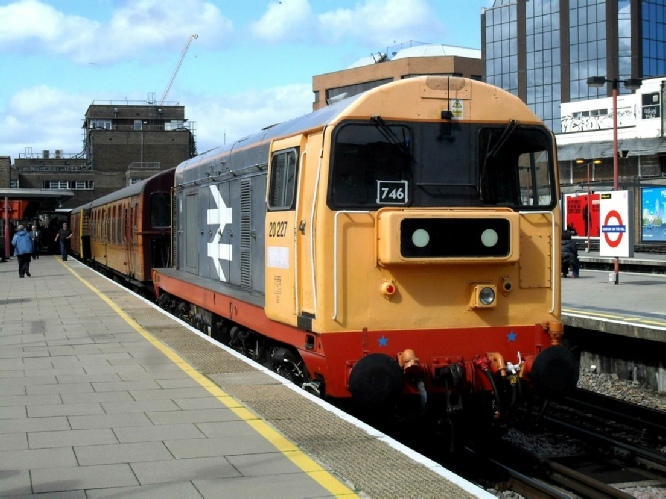 Following the end of locomotive hauled services in September 1961 Sarah Siddons went initially to British Railways for electric locomotive testing and then eventually preservation. On arrival at Amersham we were routed in the bay platform and to everyone's surprise we were told we could de-train and take photos. With the sun now out and the train in the bay, everything was in shadow but it still gave the chance to look at the locomotive. In these modern times of computerised control mechanisms and cab comfort, it really is amazing to see how basic the cab is. 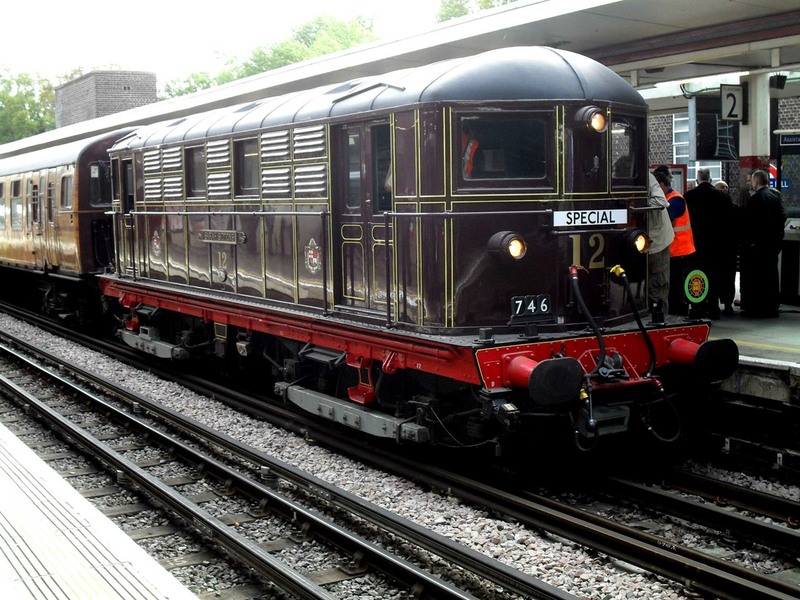 But the locomotive has a beautiful style and looks wonderful in it's Metropolitan colours. After about 10 minutes we were asked to get back on the train and 20 227 set off for Harrow. In contrast to Sarah Siddons the class 20 made lots of noise and could be heard up front taking the load of our train. The sun was out and we passed many photographers on the way back to Harrow. The tour was being run free for participants and on the way back donations were taken for charity. At Harrow there was plenty of time to take photographs. While I had to leave the tour at this point, there was still time to catch a tube ahead of the tour to North Harrow to take a final photograph of Sarah Siddons before heading home. It was a wonderful scene to end a great event. 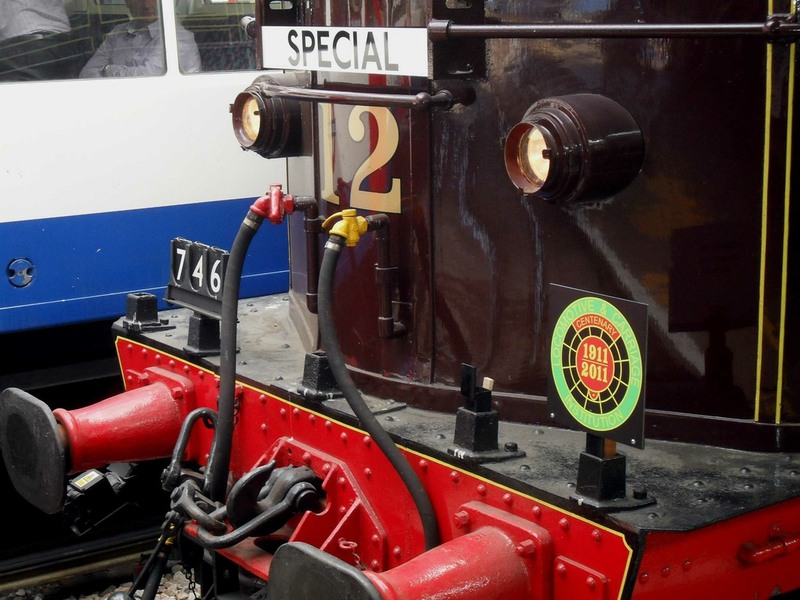 A special Locomotive and Carriage Institution Centenary headboard was carried on Sarah throughout the tour. 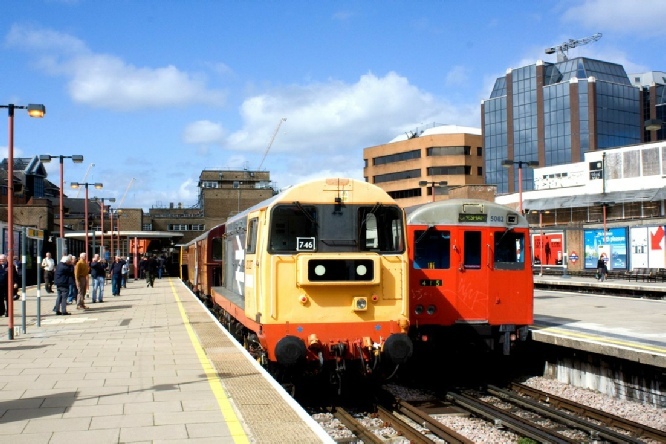 Sarah Siddons stands next to A62 stock D DM 5153 at Harrow-on-the-Hill. Another view. 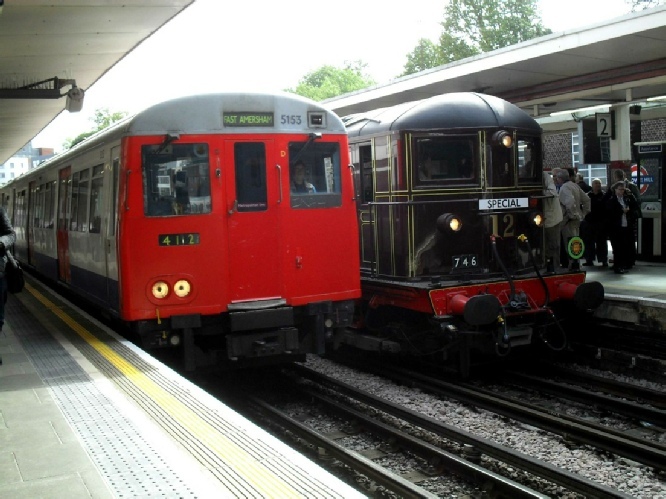 After over fifty years service the A Stock is now nearing the end of their lives as they are gradually being replaced by the new S8 stock on the Metropolitan line. 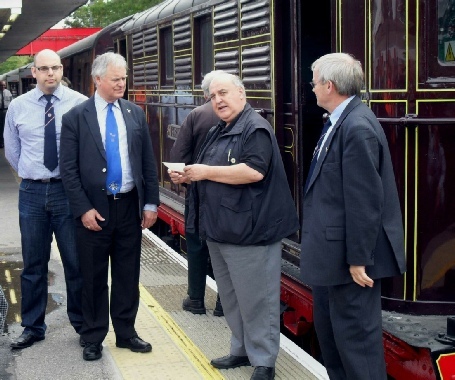 At Amersham, Humphry Gillott of the Railway Mission was presented with a cheque for £1119.40 by Alan Spencer, Chairman of the Locomotive and Carriage Institution. The donation was collected from the passengers on the tour. Some words of gratitude were said after the presentation.